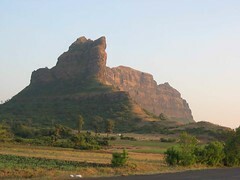 Saptashrungi Devi is Durga Devi, she is located at Vani a place near the city of Nashik in the state of Maharashtra. This place is one of the 51 shakti peeth of India and Pakistan. 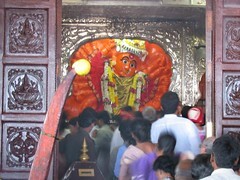 *Amba bhavani or Mahalakshmi at Kolhapur. *Renuka Devi in Village of Mahur. The devi is carved on a rock cliff on top of the mountain Saptashrung at an altitude of 1230 meters above sea level. The carving is eight feet tall and is carved on a single rock face. Devi a weapon held in each of her eighteen arms. Sapta-Shrungi means Seven Beauties, these are a chain of Seven mountain peaks and thus the name Saptashrungi identifies with Durga Devi who resides here. In general Durga Devi likes to reside on top of the mountains therefore one of here names is Parvati (of the mountains). The temple is located at N 20° 23’ 28.6”; E 73°54’25.1”, it kind of sticks to the cliff where the Devi is carved. There is a road, which goes up to and altitude of 1150 meters, from here there is flight of 470 stairs, which goes right up to the shrine. The temple is well connected with the city of Nashik with state transport buses. One of the very important books that was composed at this place is the Devi Mahatmaya or Durga Saptashati which is section of the Markendeya Puran. Sage Markandeya wrote it after doing penance on the top of a peak, which face the cliff on which the Devi resides. The Devi Mahatmaya is to be read during the Chaitra (Vernal Equinoxes) and Navratri (Autumnal Equinoxes), it is hymn which includes a number of mantras and describes the battle which take place between Durga Devi and the asuras(devils). You will notice that most of the hindu scriptures are written in such a way that it strikes a chord with the common people. It was done by dramatising the basic essence of the thought, which was required to be communicated. So also with this hymn, what it conveys is that by praying to the devi with devotion, she assists in quenching one’s malefic thought process. Thus uplifting oneself spiritually. A golden hue of the Saptashrungi hill, before the sunset. A close up of the temple from the base of the temple. To see larger sizes, click on the photos. The bigger size will open in another window. There are additional photos that can be viewed on my flickr site. Want to know how to get to this temple from Nashik? Route/Directions to Saptashrungi Devi at Vani; Maharashtra. 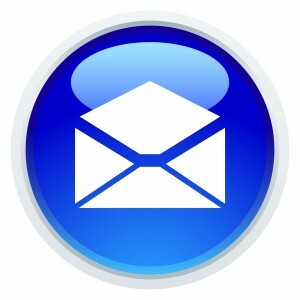 Submitted by Ajoy 10/04. Updated 8/2009. Read more articles submitted by Ajoy. I read about this temple in Life Story of Shirdi Sai Baba. Good to read these details. I think photo captions are switched. Please check the same. Thanks, Kishore. Good to know there are other references to this temple!! I have updated the captions as you have realized! Vani is our kuldevi for darshan on next friday or saturday, Just let me know road for vani darshan is open or not? i WILL PLAN FOR COME TO VANI FOR DARSHAN OF MATA.I HAVE REQUESTED MY gOVT. JOB FROM MATA.IT IS MY TRUST THAT MATA FULFILLED EVERYBODY REUEST AND PRAY. 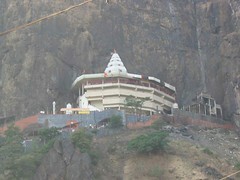 I wanted to go to the Saptashringi Mata temple this saturday (01/08/09). Can u guide me the route of how can I reach there from Mumbai ? Jai Ma Saptashringi Aapki Jay Ho Mujhe Bhi Darshan De Maa. I LIKE MATA DI.I LOVE YOU. i believe in Shree saptashurngi aai. Devi aai is our kuldevi. I wanna visit saptshrungi in jan2010.Meine kuch mannat maangi thi,wo puri hui.I wanna know in case if i can get 470(diye) and ghee(to fill 470 diye) as i need to light one diya on each of the stairs till i reach to devi mandir. Please help me and let me know if i can get this all in wani or do i need to carry this from nasik. I am not sure if we can get the diya and ghee at Vani, but it would be best to carry this from Nashik. Also it is good if one can carry out the activity early in the morning, 5 to 6 Am, since the people are less at less at this point of time. From my own experience lighting the diyas does yield positive results. I request to Government of Maharashtra and Shree Saptashrungi Nivashani Devi Trust Please show live darshan mata satpatshrungidevi. The people who made this should set the example for what humankind should be and represent. Purely perfect amazing work!! I too request to Government of Maharashtra and Shree Saptashrungi Nivashani Devi Trust Please show live darshan of mata satpatshrungidevi. I am very lucky to see the face of mata ...i want to see the live video of maa..! Sharnye Trambke Gauri Narayeni Namstute. Sharnye Trambke Gauri Narayeni Namostute. It was in did a very classy experience to read about the saptashrungi devi and watch her photo on internet. In fact a person like me who wishes to visit a place like Vani where godess devi's existence is felt at every moment had a great experience by watching your site. Durga Mata Ki Jai Ho. I want some devotional songs of Devi Saptashrungi from Krunal Music cassette "Saptashrungi Mahima". m not able 2 find it on the net. Can any1 please help me out for the same..?? I'll b very greatful 2 him/her for the help.